What is foursquare? Good question. And actually at the moment the UK hasn't really cottoned onto the wider implications of this 'social network' based on geotagging. Essentially as you move around you let foursquare know where you are. You can even create your own locations. If you are the person who has tagged themselves the most in one location you become the virtual mayor. I am now the virtual mayor of my own street. We had a party and everything. Now that's all well and good but what exactly is the point? Apparently this is a rapidly growing social network but currently I'm struggling to see why. 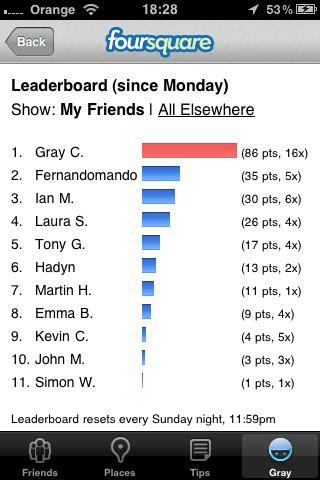 You score points every time you tag yourself at a new place and there's a leader board for comparing your stats with your friends. But that is pretty much it. Yes there's a 'leave a tip' option, so if you're at a restaurant you can leave a recommendation from the menu, but while it's still struggling for users, the incentive to do that isn't really there. Maybe that will grow over time. There's been a fair bit in the virtual press about how much of an invasion of privacy foursquare is but many of us already geotag our tweets on twitter so we're used to letting people know where we are. There's more of a facebook style 'friend relationship' too, you choose who your friends are, sending and receiving friend requests. The other way that its been touted as being useful is as a way of knowing when your friends are near by. That's an ok idea but its going to require 'checking in' on a very regular basis. I just can't imagine my circle of friends making that much of an effort with it, but maybe in the future that kind of thing will gain popularity. The app itself is very polished and perfectly easy to navigate. My issue with foursquare isn't that it's a bad app, it's not. The screens work in a similar way to those on the iPhone twitter app and feel pretty familiar. It's very easy to see where friends are, the trouble is that no one that lives particularly locally to me is on there yet. The whole thing just doesn't feel that social. Which is a bit of a shame for a social network. The joy of twitter and facebook is how easy it is to link up and communicate with people in almost any way you choose. 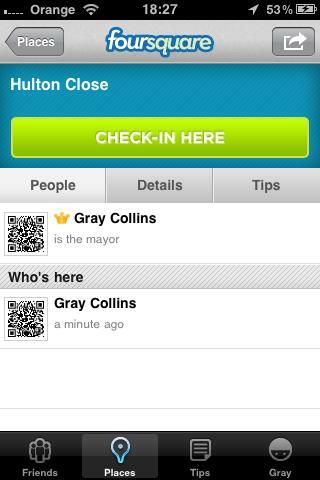 Foursquare, by contrast is just one thing, geotagging. There's no direct way of communicating other than letting someone know where you are with no built in messaging system. I can see businesses using this as a promotional tool. Enter into a store and the 'tip' has been left by a store manager with a code to get 15% off of all goods on a given day. I imagine users in the States are getting a broader experience but at the moment foursquare is pretty limited in the UK and I've yet to discover anything like that happening. What is good to see is the way that all the social networks are now linking up, however, there's a caveat to that. Link up your accounts for sure, that's how you'll find out who's using it, but as soon as that's done stop the app posting to your facebook page or twitter feed when you 'check in' or become a mayor. Failure to do this is punishable by death. The app is nice enough. But as a social network? I'll keep using it so you don't have to. If you are on foursquare feel free to add me. I promise not to burgle you when you're out. From now on if you click the image at the top of an App Review it will take you straight to the App Store. Nice huh? I thought Twitter was the acceptable face of modern stalking, but foursquare wins it. What's next? Bluetooth suppositories with miniwebcams so we can update our friends on what we've eaten and how it's digesting? I hope not... that "I don't remember eating THAT!" joke is thin enough as it is. As you say Gray, I think It just doesn't have a big enough community at the moment. Here in the UK anyway. But it will catch on. Scenario. You Go on a trip to Rome, you've been walking around and enjoying the architecture all morning, then your belly starts to rumble. Where should you eat? You bring your iphone out and check for restaurants nearby on 4square, and you see that I was in the same place last year and left 2 reviews... "Antonio's is Ok, but a bit pricey and didn't get a lot of Proscuito on my Pizza". "Genaro's was quite reasonable and I had orgasms over my pasta". You're many miles away from home but you're able to get instant recommendation from your online friends. But It's good for businesses too. Here in Edinburgh many bars and restaurants are already offering reward schemes and loyalty incentives through it. Just imagine how important a tool it will be for them once it does become more ubiquitous.